Don’t you love those times when your heart and your head align! Mine are often at odds, especially when it comes to my artwork. But this week, I had a rare coming together! With exhibition season around the corner, I’ve started the process of staging pieces to make for upcoming spring and summer shows. Much of this process revolves around trying to determine what collectors and visitors might like to see and what’s been popular in the past. I then comb through all my photos and select the appropriate painting subjects for the next 6 months. That’s the “using my head” part. Then there’s the heart. I get into these moods where I want to paint subjects that really intrigue me… and likely only me. And oftentimes, I will insert one of these unusual subjects into the practical painting list just for my own exploration. Kinda like, 3 for you, 1 for me. 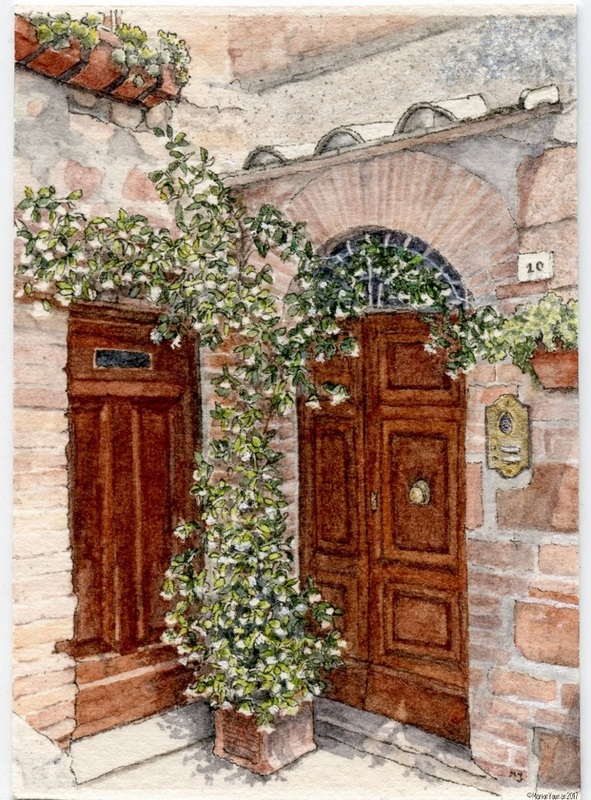 But this past weekend, I was itching to return to a popular subject – doors, flowers, and sunshine. I must have been overcome with Spring Fever! 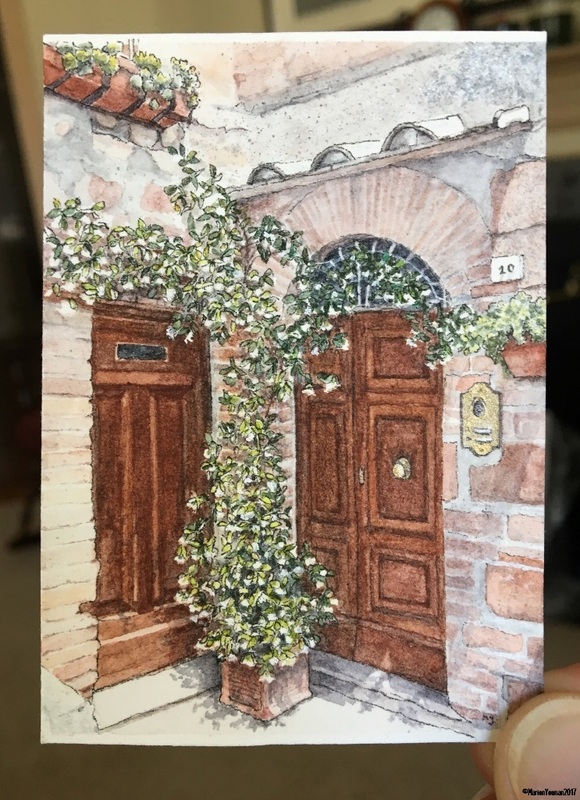 And I had so much fun painting my new Mini ink and watercolour, “Pienza Doors”, inspired by a 2009 Tuscany travel photo. So while my head and heart are awash with the Fever, I’ll be happily squeezing in a few more doors and flowers pieces! Stay tuned. Thanks for the smile, Snehal! 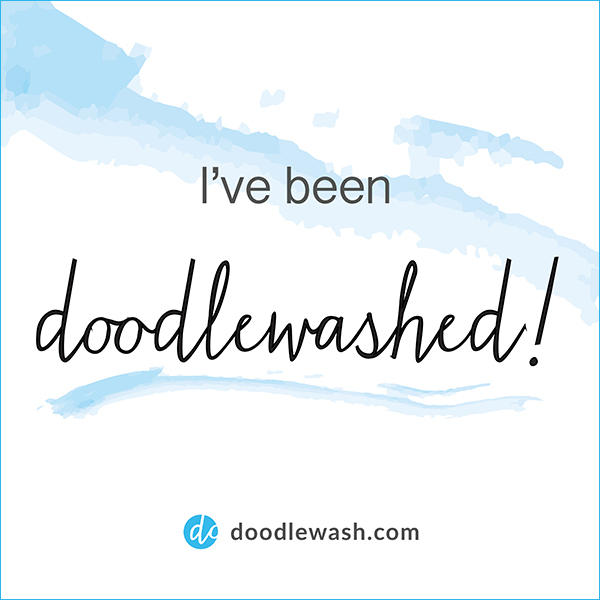 Your comments mean so much!